Anyway, I am costing up my options to upgrade my 1982 HLE 1000 which I refurbished in the project link below. I never got around to lifting the engine and dropping the front subframe and want to do this now. To compliment the engine I am also going to tidy up the engine compartment and do a 7.5 Drum to Disc Brake conversion. I have costed near enough everything up and it comes to just over £2500, but what I am trying to do now is see where I can cut / reduce any costs, by either omitting something or doing it later (without having to lift the engine maybe) after the build is completed and the car is on the road again. 1. Re-using the old clutch from the 1275 (Not the best option) (my 998 needs replacing I believe as it jumps at the top of the bite). 3. Radiator and Hoses on the 998 option as my original 998 Radiator whilst a little battered would be inappropriate for the 1275 but what about a higher performance 1079 / 1098? I am sure there will be other costs over and above the above such as paint, brake hoses etc. I also have not included the cost of sintered rockers for the 12G295. I have a HIF 38 and 44 but was considering dual SUs. I am also unsure of which choice, small bore or large bore (don't reply to that because I have already asked this question several times and the results always sway towards large bore (bang for the buck). The 998 and 1275 clutches aren't interchangeable (the 998 one is 180 and the 1275 is 190mm). And the hoes aren't, well just the top hoses are different, but changing a bottom hose isn't much fun without having to at least remove the radiator first. How much of the 1275 have you got? Although very fiddly I have replaced a bottom hose in place, not fun though! yes they are they were all the same size to start with only the very last ones got a bigger one. most of that is a waste of money. seriously look at the Minispares short motors. get a needle to suit. a few gaskets and the clutch kit you want and you are way under your figure. you could even get a Guesswork box with 3.1 and cross pin diff and still be way under your current cost. opps thats what we did. But would you consider fitting a used 1275 clutch or the a new smaller 180mm 998 clutch to a rebuilt bored out 1275 (1293). i would get the surfaces faced and fit the larger friction plate. My dad's just rebuilt my 1275 engine that's done nearly 90.000 miles and we have got away with having the bore honed and just replacing the crank shells . The valves were lightly ground and valve seats recut. 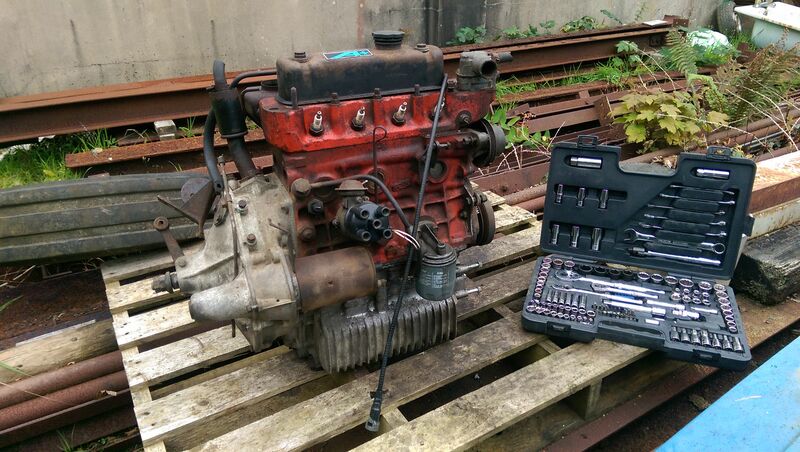 The gear box was stripped and inspected and rebuilt and the engine rebuilt and a nos mg rover clutch fitted . Everything was checked and measured and found to be in manufacturers tolorances . Maybe I was lucky but it's probably worth sending some time checking your 1275 engine and evaluating what needs to be done. The only slight problem we had was trying to find some standard piston rings be we did find some in the end. As for painting the engine bay I have just painted my minis with some professional type rattle cans from a paint supplier who mixed them. They cost about £35 but I'm well impressed with the finish i achieved . I found it a very good diy way of painting the engine bay . All of it, but needs a new alternator and water pump at well. looks like you already have electronic ignition there. Edited by nicklouse, 01 February 2019 - 08:36 PM. I recon the you'll get the biggest bang for your buck by doing up the 1300.